Forwards with confidence with a PV-powered life. Power My Home is a by-product of my enthusiasm for PV solar panels after seeing the benefits for myself. I developed this tool to empower others to see the light too. *Works on cold and most cloudy days. One sq/m of roof receives up to 1400 kWh annually. Twenty years warranty and thirty+ years lifespan. Day and night use with battery storage. Had enough of today's energy costs? Photovoltaic technologies have significantly improved, and that's why PV solar panels are growing in popularity within the UK. Additionally, new PV-to-hot water converters can be installed to use your surplus electricity to heat your hot water. EV (electric vehicle) charging adds another layer of incentive. Traditionally, evacuated tubes and heating panels were popular. Today, photovoltaics with heating-converters can do the job much better and efficiently. Today's, advancements in battery storage and electric vehicles, are now making PV viable and exciting again. I've created this learning resource for your benefit. "I wanted to see if I could be self-powered in North London in our rainy country. If I can do it, so can you." The road towards energy freedom. I can still remember that day like it was yesterday. The day I witnessed my first PV installation in awe, and that's the day my love affair with solar panels began. "At that time, PV solar panels were considered exotic technology, but today there everywhere. However, my thought of "every home should benefit from this?" has never left me." Hence, Power My Home has been a labour of love. Times were very different in 2004. Energy bills were still relatively cheap and what many now call 'the golden age of cheap energy' was only showing hints of coming to an end. Today, government policies are risking our landscape, health and local environment with toxic fracking processes in a desperate attempt to keep energy centralised. Households are spending significant amounts on energy when solar panels could be doing the heavy lifting. I advocate PV solar technologies because they're a technology of independence and very much misunderstood. Admittedly, they won't benefit you much on a snowy day in February. However, neither will your family car, but that doesn't subtract from its usefulness for the rest of the year. 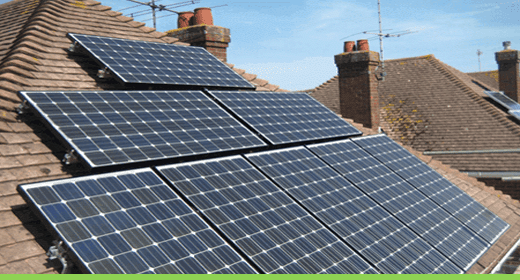 PV solar panels will reduce your family's dependence on escalating high rising energy costs. Additionally, my grandchildren will one day ask what I did to prevent 'the environmental collapse', and I want to be able to say "I did something". For anyone considering this technology, I would say this will be the best purchase you can make, especially running your EV (electric vehicle) with PV too. The energy landscape is shifting unrecognisably towards self-production. To ensure you install the most beneficial technology at the right price, I have created a network of 'trusted installers' who can help you connect the right-sized technology for your lifestyle. "PV installed in the 1960s are still generating today. A real testament to its longevity." Many people installed PV over the last decade because it was a 'sure thing' and they were 'ahead of the crowd'. Therefore, the next logical step is to trade in your old gas guzzler for an EV (electric vehicle) charged for free with the sun. Most car manufacturers have EV models nowadays, so once again 'opportunity strikes' to expand your ability to benefit from solar panels with 'free motoring mileage'. "PV-heating converters work side-by-side with tank-based heating systems all year round." Nowaday's you can generate electricity and store your evening power usage to a battery storage device. Self-consumption is the most beneficial way to get the most out of your photovoltaic system. Today, systems can be tailor built to suit different lifestyles and range from a small 1KW going up to a max of 4KW for domestic installations. These sized systems range from 750 kWh to 4,500 kWh per year. With no moving parts, PV lasts for many years with no maintenance required, so your panels will last for 25-30 years in the UK climate with batteries having 80% charge capacity after 15 years too. "The desire to unshackle yourself from expensive energy is gaining momentum. Not just in the UK, but worldwide." In addition to lower panel costs, this innovation changed the game for PV's viability. By adding this additional utility, photovoltaics can stand proudly against a withering traditional energy option. It's the ability to heat a hot water tank or thermal storage unit that gives electricity-generating solar panels an additional benefit for ownership. Before PV-heating converters were released, a secondary solar panel system was required to heat hot water using the sun. Today, this fantastic plugin gives the benefits of two solar technologies in one.